This manual is the first volume of the Radio Nav series published by Marques Aviation Ltd. The manual provides an overview of theoretical principles of the radio signal, the non-directional beacon (NDB) navaid and the automatic direction finder (ADF) avionics. This title contains an extensive collection of test questions and practical exercises designed for the user to attain proficiency in the use of ADF avionics, including the relative bearing indicator (RBI), rotatable-card and dual-pointer ADF indicators and radio magnetic indicator (RMI), for radio navigation. NDB-ADF is one of the first radio navigation systems in use. The principle of the ADF is conceptually simple. However, the use of the RBI for navigation is complex. It requires correct interpretation by the student pilot to attain proficiency and regular practice by the professional pilot to remain current. 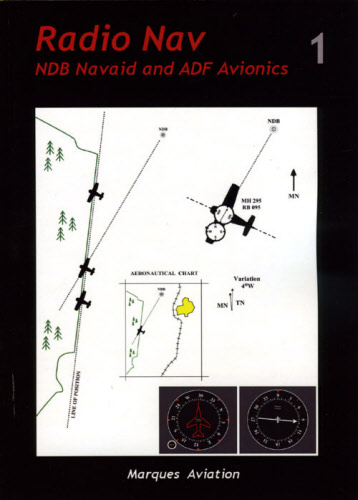 The questions and practical exercises in this manual enhance your understanding of direction finding navigation and have been designed for you to carry out mental arithmetic calculations as well as promote a sense of orientation and situational awareness so that you know where the aircraft is heading and its position relative to the NDB ground station. Attain proficiency in Radio Nav ! !